You are here: Home / Free Printables / FREE Romping & Roaring 2nd Grade Sight Words Set 1 + more! FREE Romping & Roaring 2nd Grade Sight Words Set 1 + more! For sight word practice with your second grader, check out the Romping & Roaring 2nd Grade Sight Words Set 1 from 3 Dinosaurs! The sight words are always, around, because, and been. In this free pack are 6 pages of activities such as a playdough mat, tracing work, color by letter, and more! Also included in this site is the complete set of Romping & Roaring Sight Words Set Packs available for download and purchase to get all of the sight word activities at once! 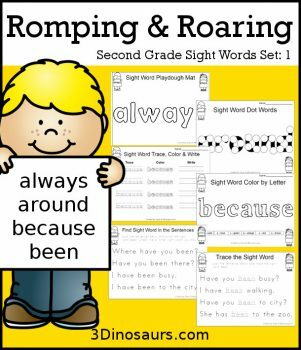 Get the Romping & Roaring 2nd Grade Sight Words Set 1 here!